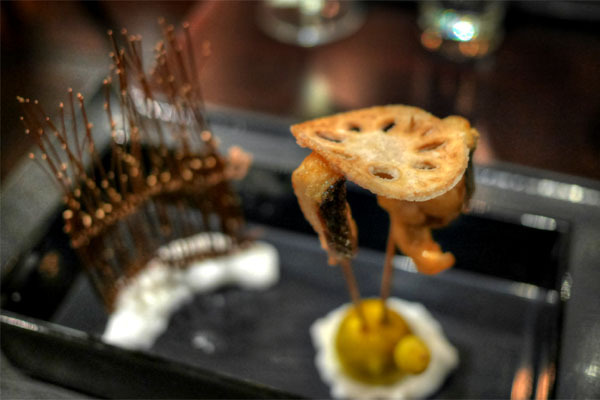 I first encountered Niki Nakayama's food over four years ago at Inaka in Arcadia, when she was holding a series of pop-up dinners at her sister's cafe. It's been great to see the progression of the Chef's cooking over the years, and given that my last meal here at the Palms location was over two years ago (a farewell to foie gras dinner), I figured that it was time to give n/naka another go. Unsurprisingly, we opted for the $165, 13-course Modern Kaiseki menu tonight, though we forewent the $85 wine pairing in favor of some of our own bottles (corkage was set at $35 a pop). 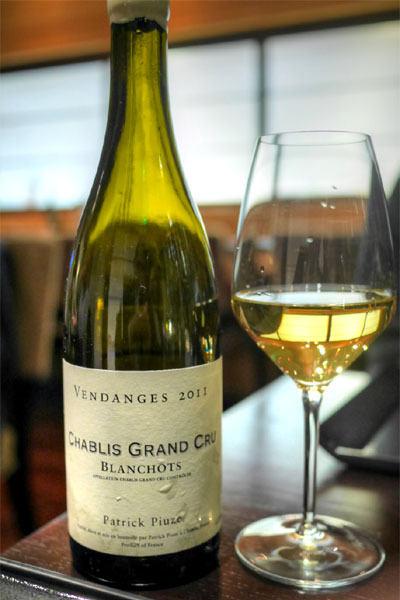 Given the food, we opted for a horizontal of white Burgundy, and got things going with the 2011 Patrick Piuze Chablis Grand Cru Blanchot. It was the most restrained of our wines, tasting flinty and fresh with a good acidity and giving off a nose loaded with bright, citrusy, grassy notes. Our dinner got off to a rousing start with the most unconventional, surprising course of the night. There was a lot going on here, but it worked together harmoniously, a blend of sweet, salty, and bitter flavors melded together by a hearty turnip soup. Great temperature contrast, too. Mouseover for a secondary photo. Renkon Lotus Root Mochi with Shrimp: Sweet, fluffy shrimp encased in lotus. Superb with a touch of tangy, spicy aioli. I wanted to pop these guys all night long. 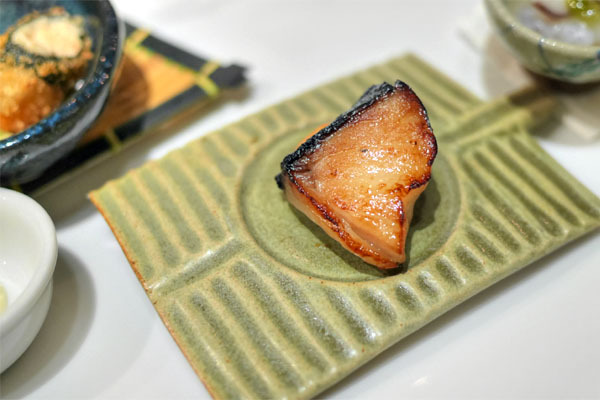 Grilled Black Cod, Persimmon with Yuzu Miso: Classic black cod misoyaki goodness, a powerhouse of char and savor with a hit of tartness from the fruit. 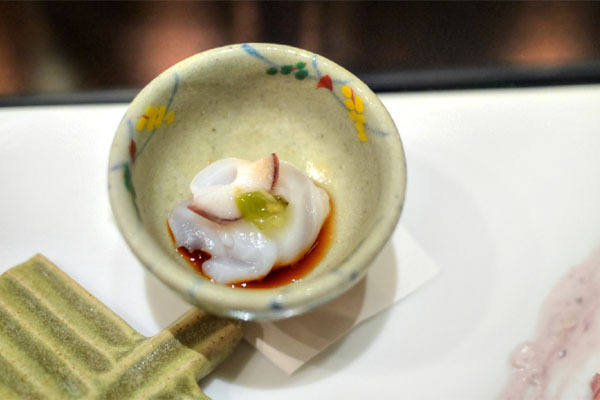 Fresh Octopus with Wasabi: Superb texture here, a blend of chewy and supple that really worked for me. 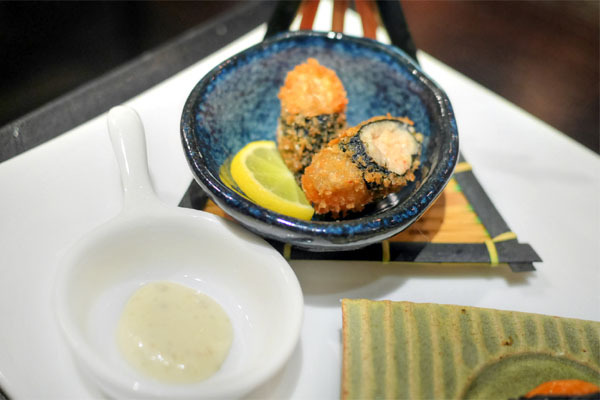 Excellent wasabi heat to counteract the sweet brine of the nama tako. 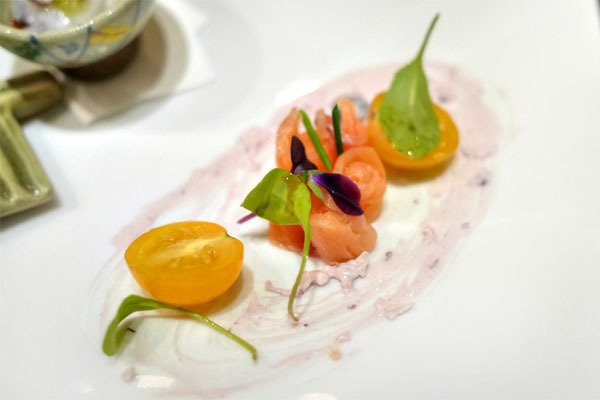 Smoked Salmon with Blueberry Cream Cheese: A nod to the traditional pairing of salmon and cream cheese, one that was surprisingly tasty, with the sweetness here working hand in hand with the herby accents present. 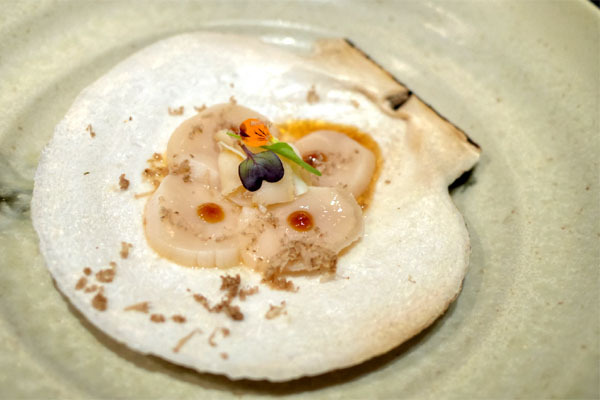 Hokkaido scallop was well represented here, its trademark sweetness augmented by honey truffle and ponzu while shavings of white truffle added an intoxicatingly earthy element to bring it all together. Great textures, too, with the silky adductor pairing well with the crunchier bits present. 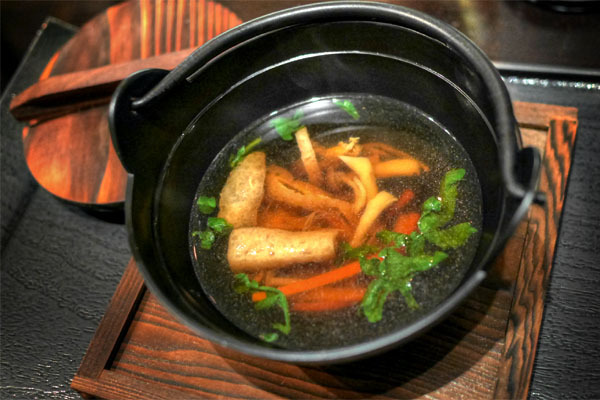 An aromatic broth brought together three varieties of mushroom, making for a hot, heartwarming liquid that was made much more interesting by the inclusion of tofu. 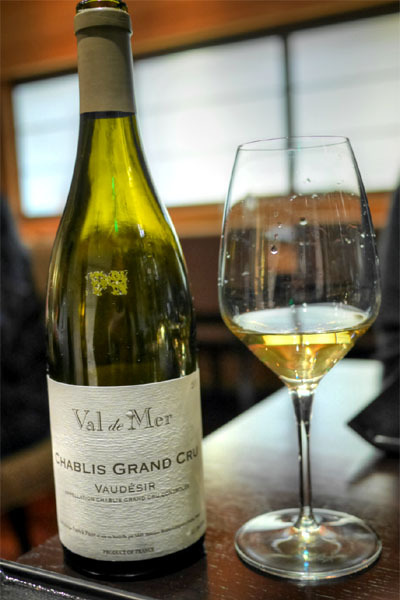 Compared to the previous wine, the 2011 Val de Mer Chablis Grand Cru Vaudésir was definitely on the more robust side, smelling of oxidative notes intertwined with fruit, with a palate that offered up more apple, citrus, and a palpable spiciness on the back end. 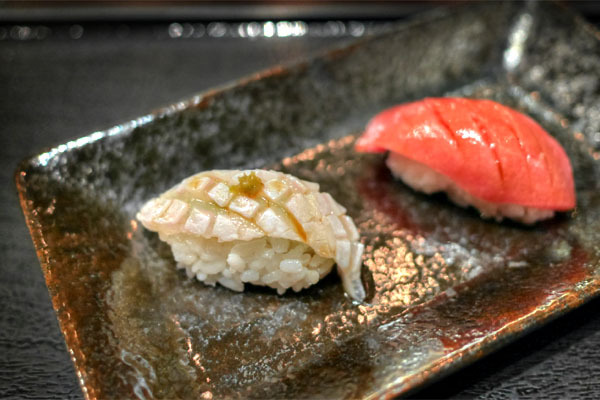 Ise Ebi: Wonderfully snappy Maine lobster, joined by a super sweet princess apple. Tai: Japanese sea bream, mild and subtle, with its flavors really brought out with a brush of soy. 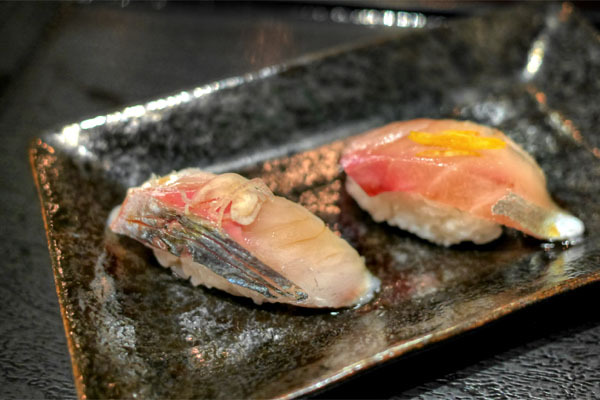 Hamachi: Also from Japan was the yellowtail, a firm, but not too fatty presentation that went seamlessly with a bit of wasabi. Otoro: Bluefin from Spain, this one was as fatty as you'd expect, with its richness set off by a dab of soy. 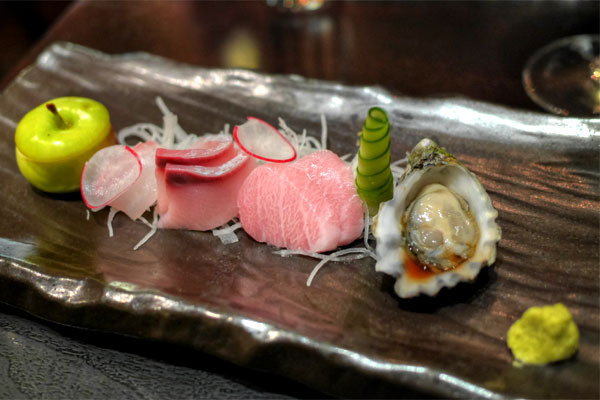 Kaki: A Kumamoto from Washington, its classic salinity moderated by the zing of ponzu. We were then presented with one of the best steamed king crab legs I've had, which perfectly conveyed the sweet brine of the crustacean. 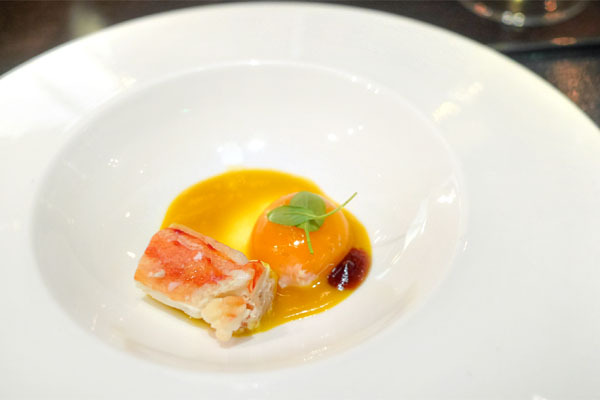 It easily stood alone; however, its various accompaniments added an engulfing sweet-savory richness that elevated, but didn't overwhelm the crab. Deep-fried sea bass was immensely satisfying, giving up a pretty incredible savoriness that was nicely set off by the ponzu-ginger. The lotus root, though, might've been even better thanks to its magnificent crunchiness--I wanted a whole bag of 'em. 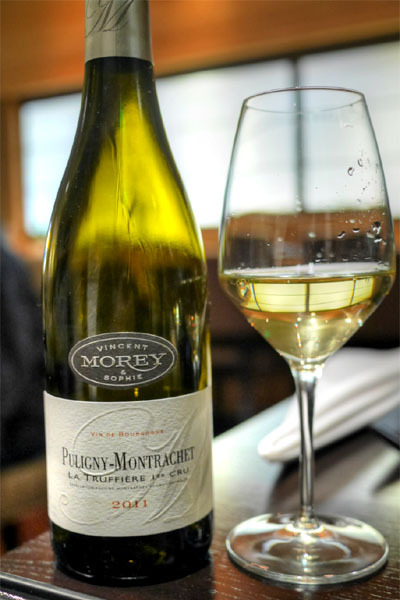 Moving away from Chablis, here we had the 2011 Domaine Vincent & Sophie Morey Puligny-Montrachet 1er Cru La Truffière, perhaps the most balanced wine of the night. I found this racy, spicy, with a subtle oxidative character overarching a commingling of fruit and minerality. Nakayama's somewhat known for her pasta preparations, and the spaghettini here has become arguably her signature. That's for good reason though. 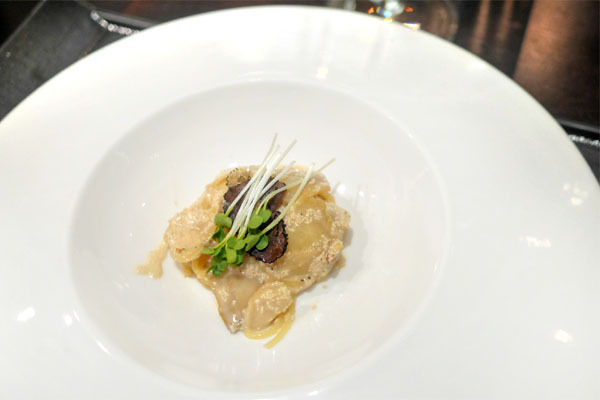 It was pretty marvelous, a luxurious, creamy dish teeming with a rich brine from the mentaiko while abalone provided a great textural counterpoint to everything. I just wanted to keep eating this. 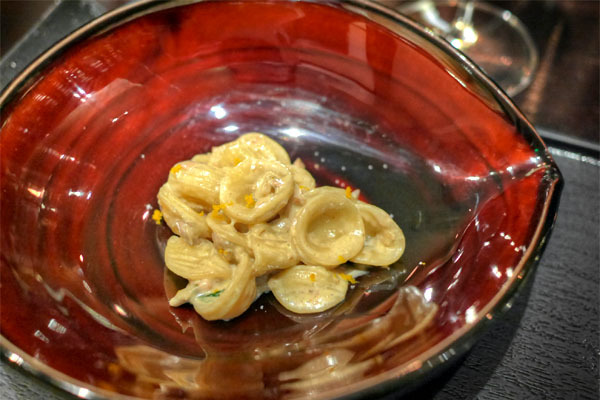 We were also presented with the orecchiette, and although it might've not reached the same lofty levels of the pasta above, it was still a damn good dish. I loved the potency of the oyster cream here, and how that just enveloped everything while the yuzu and herbs offered up a perfectly placed counterweight to it all. 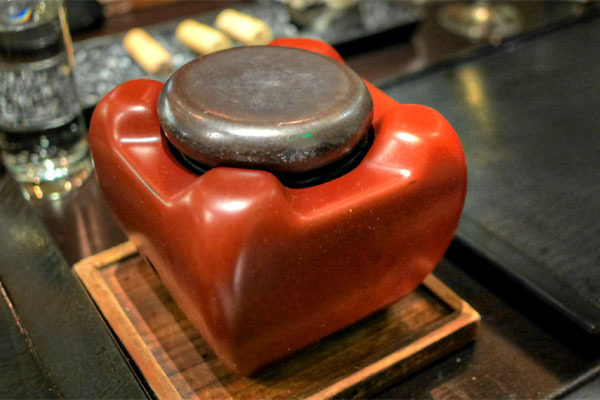 Well-marbled slices of Matsusaka beef were accompanied by a hot stone for their ishiyaki cooking method. Just a few seconds were enough for the thin, yet potent cuts of wagyu, though more time was needed for the garnishes of carrot, broccolini, cauliflower, Brussels sprout, and beet. The meat certainly stood alone, but four sauces were also provided: a thick 'n' sweet Japanese BBQ; a lush, spicy wasabi cream; sea salt-pepper-sesame oil, the sharpest, most focused of the group; and a bright, zesty ponzu-daikon oroshi. Yellowtail belly was just the right amount of fatty, its slightly sweet qualities a great match to the herby sprouts and brightness of the ponzu. 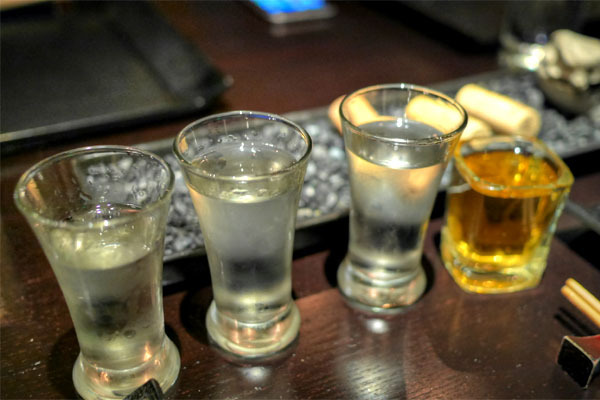 Nice shot of yuzu sake there at the end, too, which definitely helped offset the heftiness of the fish. Miyasaka Yawaraka, Junmai, Nagano, Japan [$8]: Tropical, floral, and fruity, both on the nose and palate. The smoothest and easiest drinking of the quartet here. Tedorigawa Iki Na Ona, Junmai Daiginjo, Ishikawa, Japan [$14]: Very light in terms of aroma and fairly austere in terms of taste, with a spicy quality backed by an undercurrent of alcoholic tang. Senshin, Junmai Daiginjo, Niigata, Japan [$22]: Restrained bouquet on this one as well, but it showed off the most focused rice character and refinement. Ginkobai hannaya tou, Fukui, Japan [$12]: A flavored sake, this one had lots of sweet plum up front as well as a distinct cinnamon-y spice that creeps up on you. Surprisingly tasty. Engawa: Wondrous texture on this one: chewy, but not overly so. Great hit of yuzukosho too, and I also appreciated the scoring on the surface of the fish here. 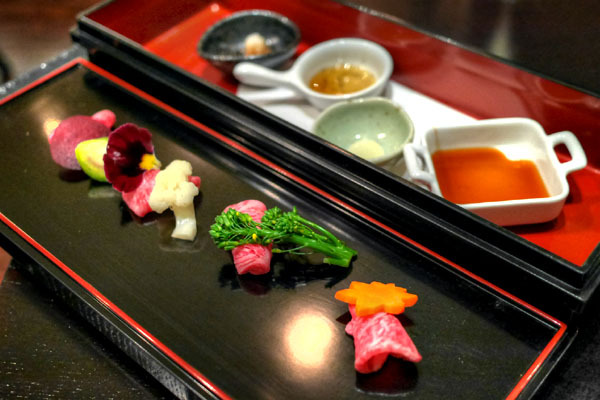 Ohtoro: Melty and velvety, with its fattiness perfectly tempered by a touch of soy. Aji: A tasty preparation of mackerel that played the inherently strong flavors of the fish against the zestiness of ponzu and myoga. 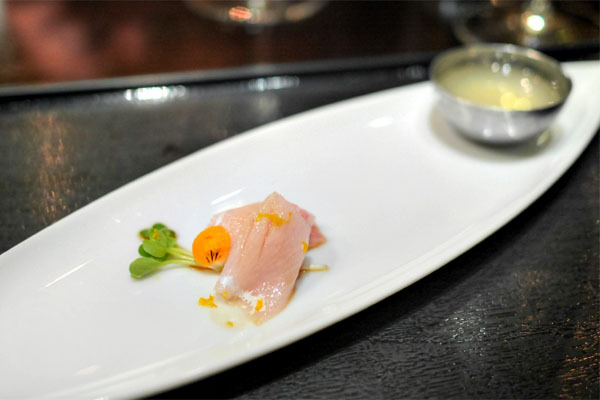 Shima Aji: Striped jack was thoroughly well-balanced, with its intrinsic savor highlighted by a dab of sour yuzu. 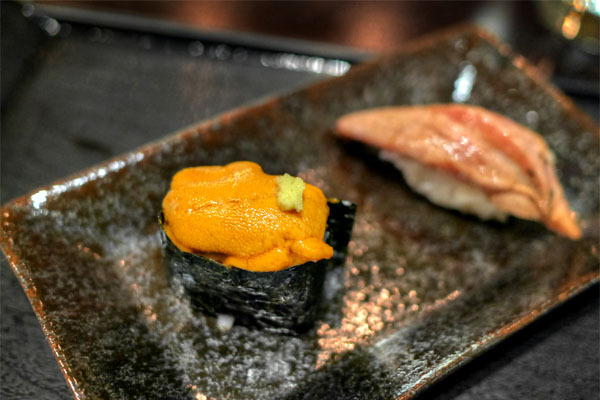 Uni: Absolutely traditional and delicious, with the lushness of the urchin pairing beautifully with a hit of wasabi heat and the richness of its nori wrapper. Aburi Toro: A super savory, fabulously charred presentation of toro that I found utterly satisfying. Yum. 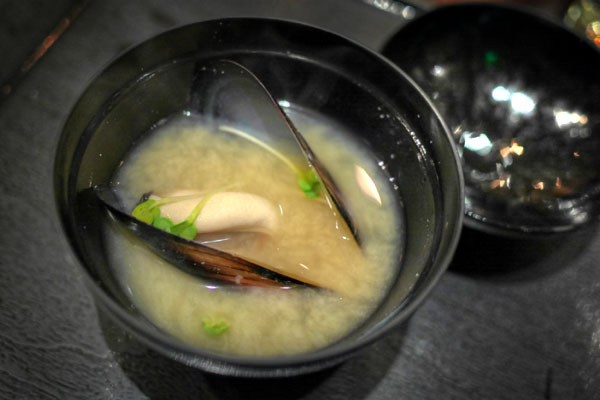 The miso soup was spot on, conveying all the classic flavors and nuances that you'd want, but with the additional brine from the plumpest, meatiest mussel I think I'd ever encountered. 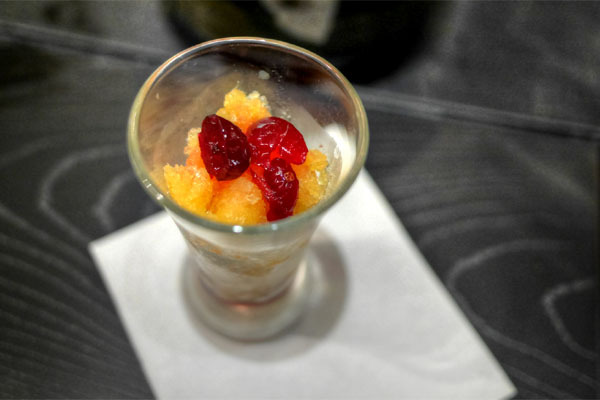 With the savories done with, the desserts commenced with this palate cleanser: a tangerine granité with cranberry. Think tangy and sweet and icy, a refreshing intermezzo and a great match with the tea below. 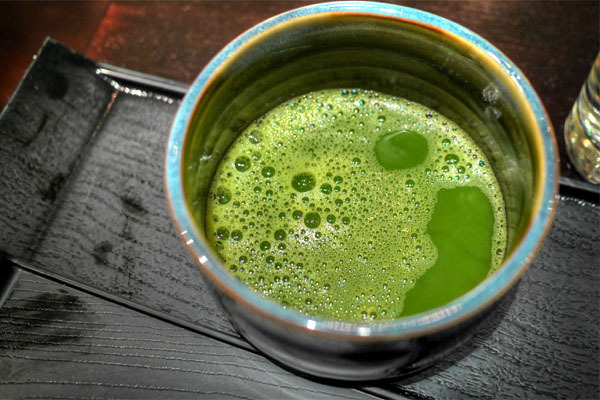 Matcha arrived frothy and gritty and bitter, a comforting, yet bracing sort of tea. 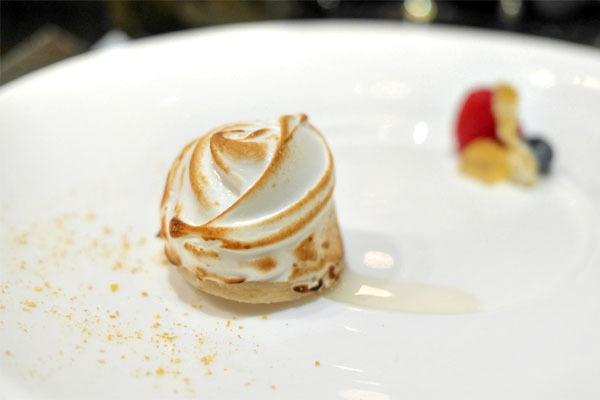 Dessert proper came from Pastry Chef Leslie Bilderback, a take on the classic baked Alaska. Tart, fruity flavors of lemon worked swimmingly alongside the buttery crust here, and the zing of the chile jelly was a much appreciated accent piece as well. 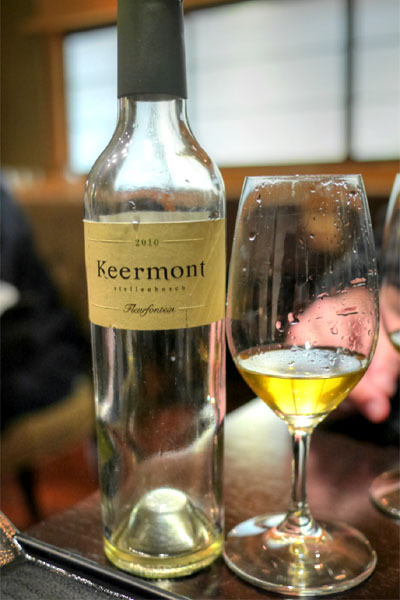 We finished with the 2010 Keermont Fleurfontein, a limited-edition (just 580 bottles produced) dessert wine from the Stellenbosch region of South Africa. It was as delectable as I was hoping for, a rich, concentrated wine with bountiful flavors of apple and honey sweetness countered by a lively, noticeable acidity. 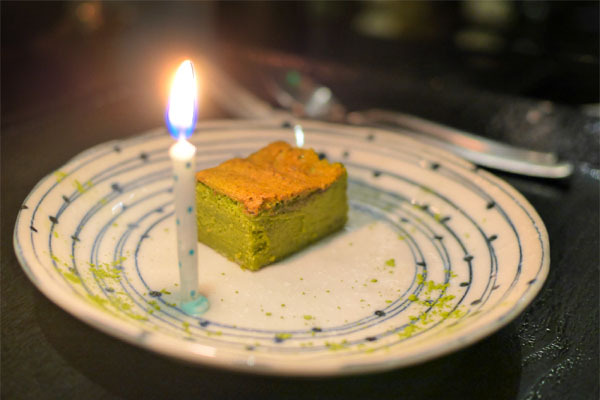 A complementary green tea cake was brought out for a dining companion's birthday. I'm happy to report that Nakayama's cooking is better than it's ever been. Her food has certainly grown in both confidence and finesse since I've known her, and this latest experience made that abundantly clear. 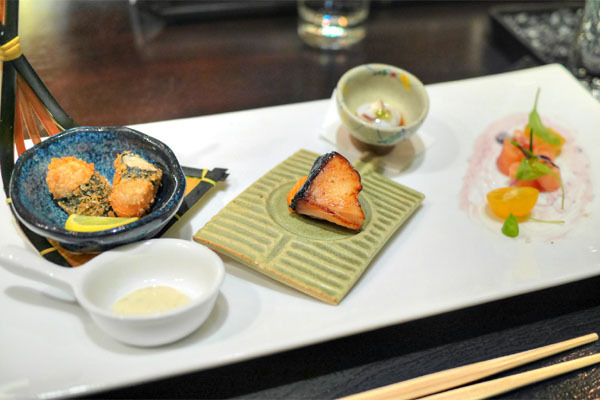 With its deft blend of the traditional and the modern, n/naka's a standout in the Japanese scene here in LA, so definitely put this place on your short list if you haven't already. Thanks a lot Kevin! i´ll visit N/naka in less than two weeks. it`s great to know they are running at such a high level. Gotta go back, we did a white burgundy dinner there as well a couple of years ago. Good pairings. Great to see that they're still producing great food since they started. Gotta go back one of these days when I'm in LA. I've gotta get back too, been about a year and it is so good. I just have way too many dinners. Four this week alone! Fausto: Did you end up making it here? Charlie: I'd like to take credit, but the wines were mostly the work of Ryan, save for the sticky. Sam: When are you going to be back in town? Andy: Four a week is too much for me! Yes Kevin, i enjoyed it a lot. We enjoyed every dish. The wine pairings were reasonable. It will be my wife favorite restaurant for a while. Next day we hit Saison at SF. The tag was double the total of n/naka. And yes, the wine program is on another level, the tasting includes krug, and really good burgundy Premier Crus. 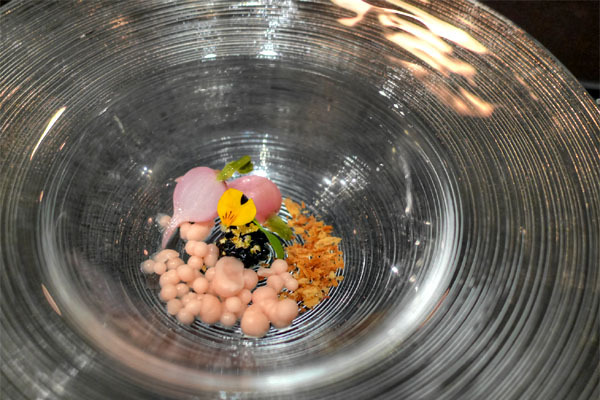 Some dishes blew my mind, but i am not fond of paying that much $$$$ for some of the dishes that focus on one vegetable.